[p.263] Zion’s Camp in 1834 was to redeem Zion and replant the Saints in their inheritances in Jackson County, Missouri. This did not happen. Joseph Smith, Jr., said the Saints would need to wait a little season for Zion’s redemption. Out of the failure of the camp came major organizational changes with a Quorum of Twelve Apostles and a group known as the Seventy. The Saints purchased four Egyptian mummies and some papyri in 1835. A revelation appointed Warren Parrish as a new scribe for Joseph Smith. At Kirtland, Ohio, the building of the House of the Lord (temple) took resources in time and money. The Kirtland temple was dedicated in March 1836. Many spiritual experiences were reported by church members in the temple. Smith traveled to Salem, Massachusetts, on business to obtain funds in a quest to alleviate debt. Internal dissent occurred over Kirtland banking activities. Disagreement with Smith caused apostasy among some leaders and members. Smith received revelations in January 1838 including one to leave Ohio for Far West, Missouri. Behold, I say unto you, were it not for the transgressions of my people, speaking concerning the church and not individuals, they might have been redeemed, even now; but, behold, they have not learned to be obedient to the things which I require at their hands, but are full of all manner of evil, and do not impart of their substance as becometh saints, to the poor and afflicted among them, and are not united according to the union required by the law of the Celestial kingdom; and [p.264] Zion cannot be built up unless it is by the principles of the law of the Celestial Kingdom, otherwise I can not receive her unto myself. And my people must needs be chastened until they learn obedience, if it must needs be by the things which they suffer. I speak not concerning those who are appointed to lead my people, who are the first elders of my church, for they are not all under this condemnation; but I speak concerning the Churches abroad: there are many who will say, Where is their God? Behold, he will deliver in time of trouble, otherwise we will not go up unto Zion, and will keep our moneys. Th[e]refore, in consequence of the transgressions of my people, it is expedient in me that mine elders should wait for a little season for the redemption of Zion, that they themselves may be prepared, and that my people may be taught mor[e] perfectly, and have experience, and know more perfectly concerning their duty and the things which I require at their hands. And this can not be brought to pass until mine elders are endowed with power from on high; for behold, I have prepared a greater endowment and blessing to be poured out upon them, inasmuch as they are faithful, and continue, in humility before me. Behold, the destroyer I have already sent forth to destroy and lay waste mine enemies, and not many years hence they shall not be left to pollute mine heritage, and to blaspheme my name upon the lands which I have consecrated for the gathering together of my saints. Behold, I have commanded my servant Joseph [Smith, Jr.] to say to the strength of my house even my warriors, my young men and middleaged, to gather together for the redemption of my people, and throw down the towers of mine enemies, and scatter their watchmen; but the strength of mine house has not hearkened unto my words: but inasmuch as there are those that have hearkened unto my word I have prepared a blessing and an endowment for them I have heard their prayers and will accept their offering. And it is expedient in me that they should be brought thus far for a trial of their faith. And now, verily I say unto you, a commandment I give unto you, that as many as have come hither that can stay in the regions round about, let them stay, and those who cannot stay, who have families in the east, let them tarry for a little season, inasmuch as my servant Joseph [Smith, Jr.] shall appoint unto them; for I will counsel him concerning this matter, and all things whatsoever he shall appoint unto them, shall be fulfilled. And let all may [my] people who dwell in the regions round about be very faithful, and prayerful, and humble before me, and reveal not the things which I have revealed unto them, and talk not of judgments, neither boast of faith no[r] of mighty works, but carefully gather together as much in one region as can be consis-[p.265] tantly with the feelings of the people; and behold, I will give unto you favor and grace in their eyes, that you may rest in peace and safety, while you are saying unto the people, Execute judgment and justice for us, according to law, and redress us of our wrongs. Now behold, I say unto you my friends, in this way you may find favor in the eyes of the people until the army of Israel has become very great, and I will soften the hearts of the people as I did the heart of Pharaoh, from time to time, until my servant Joseph [Smith, Jr.], and mine elders, whom he shall appoint, shall have time to gather up the strength of mine house, and to have sent wise men to fulfill that which I have commanded concerning the purchasing of all the lands in Jackson county that can be purchased, and in the adjourning [adjoining] counties round about; for it is my will that these lands should be purchased; and after they are purchased, that my saints should possess them according to the law of consecration which I have given. And after these lands are purchased I will hold the armies of Israel guiltless in taking possession of their own lands, and of throwing down the towers of mine enemies that may be upon them, and scattering their watchmen and avenging me of mine enemies, unto the third and fo[u]rth generation of them that hate me. But firstly let my army become very great, and let it be sanctified before me, that it may become fair as the sun, and clear as the moon, and that her banners may be terrible unto all nations, that the kingdoms of this world may be constrained to acknowledge that the kingdom of Zion, is, in very deed, the kingdom of our God and his Christ; therefore, let us become subject unto her laws. There has been a day of calling, but the time has come for a day of choosing, and let those be chosen that are worthy: and it shall be manifest unto my servant Joseph [Smith, Jr.] by the voice of the Spirit those who are chosen, and they shall be sanctified: and inasmuch as they follow the counsels which they receive, they shall have power after many days to accomplish all things pertaining to Zion. And again, I say unto you, sue for peace, not only the people that have smitten you, but also to all people; and lift up an ensign of peace, and make a proclamation for peace unto the ends of the earth: and make proposals for peace unto those who [p.266] have smitten you, according to the voice of the Spirit which is in you; and all things shall work together for your good; and be faithful: and behold, and lo; I am with you even unto the end, even so; Amen. It is my will that my servant Warren [A. Cowdery] should be appointed and ordained a presiding High Priest over my church in the land of Freedom [New York] and the regions round about; and should preach my everlasting gospel, and lift up his voice and warn the people, not only in his own place, but in the adjoining countries [counties], and devote his whole time in this high and holy calling which I now give unto him; seeking dilligently the kingdom of heaven and its righteousness, and all things necessary shall be added thereunto; for the laborer is worthy of his hire. And again, verily I say unto you, the coming of the Lord draweth nigh, and it overtaketh the world as a thief in the night: therefore, gird up your loins, that ye may be the children of the light, and that day shall not ove[r]take you as a thief. And again, verily I say unto you, there was joy in heaven when my servant Warren [A. Cowdery] bowed to my scepter and separated himself from the crafts of men. Therefore, blessed is my servant Warren [A. Cowdery], for I will have mercy on him, and notwithstanding the vanity of his heart, I will lift him up, and inasmuch as he will humble himself before me; I will give him grace and assurance wherewith he may stand; and if he continues to be a faithful witness, and a light unto the church, I have prepared a crown for him in the mansion of my Father: even so, Amen. [p.267] And there must needs be a repentance and a refor[m]ation among you, in all things, in your ensamples [examples] before the Church, and before the world, in all your manners, habits and customs, and salutations one toward another – rendering unto every man the respect due the office, calling, and priesthood, whereunto I the Lord have appointed and ordained you. Amen. There are, in the church, two priesthoods, namely: the Melchizedek, and the Aaronic, including the Levitical priesthood. Why the first is called the Melchizedek priesthood, is because Melchizedek was such a great high priest: before his day it was called the holy priesthood, after the order of the Son of God; but out of respect or reverence to the name of the Supreme Being, to avoid the too frequent repetition of his name, they, the church, in ancient days, called that priesthood after Melchizedek, or the Melchizedek priesthood. All other authorities, or offices in the church are appendages to this priesthood; but there are two divisions, or grand heads—one is the Melchizedek priesthood, and the other is the Aaronic, or Levitical priesthood. The office of an elder comes under the priesthood of Melchizedek. The Melchizedek priesthood holds the right of presidency, and has power and authority over all the offices in the church, in all ages of the world, to administer in spiritual things. The presidency of the high priesthood, after the order of Melchizedek, have a right to officiate in all the offices in the church. High priests, after the order of the Melchizedek priesthood, have a right to officiate in their own standing, under the direction of the presidency, in administering spiritual things, and also in the office of an elder, priest, (of the Levitical order,) teacher, deacon and member. An elder has a right to officiate in his stead when the high priest is not present. The high priest, and elder, are to administer in spiritual things, agreeably to the [p.268] covenants and commandments of the church; and they have a right to officiate in all these offices of the church when there are no higher authorities present. The second priesthood is called the priesthood of Aaron, because it was conferred upon Aaron and his seed, throughout all their generations. Why it is called the lesser priesthood, is because it is an appendage to the greater, or the Melchizedek priesthood, and has power in administering outward ordinances. The bishopric is the presidency of this priesthood and holds the keys, or authority of the same. No man has a legal right to this office, to hold the keys of this priesthood, except he be a litteral [literal] descendant of Aaron. But as a high priest, of the Melchizedek priesthood, has authority to officiate in all the lesser offices, he may officiate in the office of bishop when no literal descendant of Aaron can be found; provided he is called and set apart and ordained unto this power by the hands of the presidency of the Melchizedek priesthood. The power and authority of the higher or Melchizedek priesthood, is to hold the keys of all the spiritual blessings of the church—to have the privilege of receiving the mysteries of the kingdom of heaven—to have the heavens opened unto them—to commune with the general assembly and church of the first born, and to enjoy the communion and presence of God the Father, and Jesus the Mediator of the new covenant. The power and authority of the lesser, or Aaronic priesthood, is, to hold the keys of the ministering of angels, and to administer in outward ordinances—the letter of the gospel—the baptism of repentance for the remission of sins, agreeably to the covenants and commandments. Of necessity there are presidents, or presiding offices growing out of, or appointed of, or from among those who are ordained to the several offices in thess [these] two priesthoods. Of the Melchizedek priesthood, three presiding high priests, chosen by the body, appointed and ordained to that office, and upheld by the confidence, faith and prayer of the church, form a quorum of the presidency of the church. The twelve travelling counsellors are called to be the twelve apostles,7 or special witnesses of the name of Christ, in all the world: thus differing from other officers in the church in the duties of their calling. And they form a quorum equal in authority and power to the three presidents, previously mentioned. The seventy8 are also called to preach the gospel, and to be especial witnesses unto the Gentiles and in all the world. Thus differing from other officers in the church in the duties of their calling: and they form a quorum equal in authority to that of the twelve especial witnesses or apostles, just named. And every decision made by either of these quorums, must be by the unanimous voice of the same; that is, every member in each quorum must be agreed to [p.269] its decisions in order to make their decisions of the same power or validity one with the other. [A majority may form a quorum when circumstances render it impossible to be otherwise. ]9 Unless this is the case, their decisions are not entitled to the same blessings which the decisions of a quorum of three presidents were anciently, who were ordained after the order of Melchizedek, and were righteous and holy men. The decisions of these quorums, or either of them are to be made in all righteousness; in holiness and lowliness of heart; meekness and long suffering; and in faith and virtue and knowledge; temperance, patience, godliness, brotherly kindness and charity, because the promise is, if these things abound in them, they shall not be unfruitful in the knowledge of the Lord. And in case that any decision, of these quorums, is made in unrighteousness, it may be brought before a general assembly of the several quorums which constitute the spiritual authorities of the church, otherwise there can be no appeal from their decision. The twelve are a travelling, presiding high council, to officiate in the name of the Lord, under the direction of the presidency of the church, agreeably to the institution of heaven; to build up the church, and regulate all the affairs of the same, in all nations: first unto the Gentiles, and secondly unto the Jews. The seventy are to act in the name of the Lord, under the direction of the twelve, or the travelling high council, in building up the church and regulating all the affairs of the same, in all nations: first unto the Gentiles and then to the Jews:—the twelve being sent out, holding the keys, to open the door by the proclamation of the gospel of Jesus Christ; and first unto the Gentiles and then unto the Jews. The standing high councils, at the stakes of Zion, form a quorum equal in authority, in the affairs of the church, in all their decisions, to the quorum of the Presidency, or to the travelling high council. The high council in Zion, forms a quorum equal in authority, in the affairs of the church, in all their decisions, to the councils of the twelve at the stakes of Zion. It is the duty of the travelling high council to call upon the seventy, when they need assistance, to fill the several calls for preaching and administering the gospel, in stead of any others. It is the duty of the twelve in all large branches of the church, to ordain evangelical ministers,10 as they shall be designated unto them by revelation. From Adam to Seth, who was ordained by Adam at the age of 69 years, and was blessed by him three years previous to his (Adam’s) death, and received the promise of God by his father, that his posterity should be the chosen of the Lord, and that [p.270] they should be preserved unto the end of the earth, because he [Seth]12 was a perfect man, and his likeness was the express likeness of his father’s, insomuch that he seemed to be like unto his father in all things; and could be distinguished from him only by his age. Enos was ordained at the age of 134 years, and four mouths, by the hand of Adam. God called upon Cainan in the wilderness, in the fortieth year of his age, and he met Adam in journeying to the place Shedolamak: he was eighty seven years old when he received his ordination. Mahalaleel was 496 years and seven days old when he was ordained by the hand of Adam, who also blessed him. Jared was 200 years old when he was ordained under the hand of Adam, who also blessed him. Methuselah was 100 years old when he was ordained under the hand of Adam. Lamech was 32 years old when he was ordained under the hand of Seth. Noah was 10 years old when he was ordained under the hand of Methuselah. Three years previous to the death of Adam, he called Seth, Enos, Cainan, Mahalaleel, Jared, Enoch and Methuselah, who were all high priests, with the residue of his posterity, who were righteous, into the valley of Adam-ondi-Ahman, and there bestowed upon them his last blessing. And the Lord appeared unto them, and they rose up and blessed Adam, and called him Michael, the Prince, the Arch angel. And the Lord administered comfort unto Adam, and said unto him, I have set thee to be at the head: a multitude of nations shall come of thee; and thou art a prince over them for ever. And Adam stood up in the midst of the congregation, and notwithstanding he was bowed down with age, being full of the Holy Ghost, predicted whatsoever should befall his posterity unto the latest generation. These things were all written in the book of Enoch, and are to be testified of in due time. To the church of Christ in the land of Zion, in addition to the church laws, respecting church business: Verily, I say unto you, says the Lord of hosts, There must [p.271] needs be presiding elders, to preside over those who are of the office of an elder; and also priests, to preside over those who are of the office of a priest; and also teachers to preside over those who are of the office of a teacher, in like manner; and also the deacons: wherefore, from deacon to teacher, and from teacher to priest, and from priest to elder, severally as they are appointed, according to the covenants and commandments of the church; then comes the high priesthood, which is the greatest of all. Wherefore, it must needs be that one be appointed, of the high priesthood, to preside over the priesthood; and he shall be called president of the high priesthood of the church, or, in other words, the presiding high priest over the high priesthood of the church. From the same comes the administering of ordinances and blessings upon the church, by the laying on of the hands. Wherefore the office of a bishop is not equal unto it; for the office of a bishop is in administering all temporal things: nevertheless, a bishop must be chosen from the high priesthood, unless he is a literal descendant of Aaron; for unless he is a literal descendant of Aaron he cannot hold the keys of that priesthood. Nevertheless, a high priest, that is after the order of Melchizedek, may be set apart unto the ministering of temporal things, having a knowledge of them by the Spirit of truth, and also to be a judge in Israel, to do the business of the church to sit in judgment upon transgressors, upon testimony, as it shall be laid before him, according to the laws, by the assistance of his counsellors, whom he has chosen, or will choose among the elders of the church. This is the duty of a bishop who is not a literal descendent of Aaron, but has been ordained to the high priesthood after the order of Melchiz- edek. Again, verily, I say unto you: The most important business of the church, and the most difficult cases of the church, inasmuch as there is not satisfaction upon the decision of the bishop, or judges, it shall be handed over and carried up unto the council of the church, before the presidency of the high priesthood; and the presidency of the council of the high priesthood shall have power to call other high priests, even twelve, to assist as counsellors; and thus the presidency of the high priesthood, and its counsellors shall have power to decide upon testimony according to the laws of the church. And after this decision it shall be had in remembrance [p.272] no more before the Lord; for this is the highest council of the church of God, and a final decision upon controversies, in spiritual matters. There is not any person belonging to the church, who is exempt from this council of the church. And in as much as a president of the high priesthood shall transgress, he shall be had in remembrance before the common council of the church, who shall be assisted by twelve counsellors of the high priesthood; and their decision upon his head shall be an end of controversy concerning him. Thus, none shall be exempted from the justice and the laws of God; that all things may be done in order and in solemnity, before him, according to truth and righteousness. And again, verily I say unto you, the duty of a president over the office of a deacon, is to preside over twelve deacons, to sit in council with them, and to teach them their duty—edifying one another, as it is given according to the covenants. And also the duty of the president over the office of the teachers, is to preside over twenty four of the teachers, and to sit in council with them—teaching them the duties of their office, as given in the covenants. Also the duty of the president over the priesthood of Aaron, is to preside over forty eight priests, and sit in council with them, to teach them the duties of their office, as is given in the covenants. This president is to be a bishop; for this is one of the duties of this priesthood. Again, the duty of the president over the office of elders is to preside over ninety six elders, and to sit in council with them, and to teach them according to the covenants. This presidency is a distinct one from that of the seventy, and is designed for those who do not travel into all the world. whereas other offices of the church who belong not unto the twelve neither to the seventy, are not under the responsibility to travel among all nations, but are to travel as their circumstances shall allow, notwithstanding they may hold as high and responsible offices in the church. Wherefore, now let every man learn his duty, and to act in the office in which he is appointed, in all diligence. He that is slothful shall not be counted worthy to stand, and he that learns not his duty and shows himself not approved, shall not be counted worthy to stand; even so. Amen. it is not my will that my servant Frederick [G. Williams] should go to New York, but inasmuch as he wishes to go and visit his relatives that he may warn them to flee the wrath to come let him go and see them, for that purpose and let that be his only business, and behold in this thing he shall be blessed with power to overcome their prejudices, Verily thus saith the Lord Amen. therefore Verely [Verily] thus saith the Lord your God I appointed these twelve that they should be equal in their ministry and in their portion and in their evangelical rights, wherefore they have sin[n]ed a verry [very] grevious sin, in asmuch as they have made themselves unequal and have not hearkned unto my voice ther[e]for[e] let them repent speedily and prepare their hearts for the solem[n] assembly and for the great day which is to come Verely [Verily] thus saith the Lord Amen. Verily thus saith the Lord unto you: let him who was my servant Harvey [Whitlock], return unto me;— and unto the bosom of my Church, and forsake all the [p.277] sins wherewith he has offended against me and persue [pursue] from hence forth a virtuous and upright life, and remain under the direction of those whom I have appointed to be pillars, and heads of my church, and behold, saith the Lord, your God; his sins shall be blotted out from under heaven, and shall be forgotten from among men, and shall not come up in mine ears, nor be recorded as a memorial against him, but I will lift him up as out of deep mire, and he shall be exalted upon the high places, and shall be counted worthy to stand ammong [among] princes, and shall yet be made a polished shaft in my quiver, of bringing down the strong holds of wickedness, among those who set themselves up on high, that they may take council against me, and against annointed ones in the last days. Therefore let him prepare himself speedily and come unto you; even to Kirtland and inasmuch as he shall h[e]arken unto all your council [counsel] from henceforth he shall be restored unto his former state, and shall be saved unto the uttermost, even as the Lord your God livith [liveth] Amen. I am the first and the last, I am he who liveth, I am he who was slain. I am your Advocate with the Father. Behold your sins are forgiven you. You are clean before me, therefore, lift up your heads and rejoice, let the hearts of your brethren rejoice and let the hearts of all my people rejoice, who have with their might, built this house to my name. For behold I have accepted this house and my name shall be here; and I will manifest myself to my people, in mercy, in this House, yea I will appear unto my servants and speak unto them with mine own voice, if my people will keep my commandments and do not pollute this Holy House. Yea the hearts of thousands and tens of thousands shall greatly rejoice in consequence of the blessings which shall be poured out, and the endowment with which my servants have already been endowed and shall hereafter be endowed in this House. And the fame of this House shall spread to foreign lands, and this is the beginning of the blessing, which shall be poured out upon the heads of my people. even so Amen. After this vision closed, the Heavens were again opened unto them and Moses appeared before them and committed unto them the keys of the gathering of Israel from the four parts of the Earth and the leading of the ten tribes from the Land of the North. After this Elias28 appeared and committed the dispensation of the gospel of Abraham, saying, that in them and their seed all generations after them should be blessed. [p.281] A revela[t]ion Salem (M[as]s.) August 6, 1836. I the Lord your God am not displeased with your coming this Journey, notwithstandi[n]g your follies I have much treasure in this city for you, for the benefit of Zion; and many people in this city whom I will gather out in due time for the benefit of Zion, through your instrumentality. Therefore it is expedient that you should form acquaintance with men in this city, as you shall be led, and as it shall be given you. And it shall come to pass, in due time, that I will give this city into your hands, that you shall have power over it, insomuch that they shall not discover your secret parts; and its wealth, pertaining to gold and silver, shall be yours. Concern not yourselves about your debts, for I will give you power to pay them. Concern not yourselves about Zion, for I will deal merciful[ly] with her. Tarry in this place and in the regions round about, and the place where it is my will that you should tarry, for the main, shall be signalized unto you by the peace and the power of my Spirit, that shall flow unto you. This place you may obtain by hire &c. And inquire diligently concerning the more ancient inhabitants and founders of this city, for there are more treasures than one for you, in this city: Therefore, be ye as wise as serpents and yet without sin, and I will order all things for your good as fast as ye are able to receive them: Amen. A Revelation given Kirtland July 23rd 1837. The word of the Lord unto Thomas, B. Marsh concerning the twelve Apostles of the Lamb. Verily thus saith the Lord unto you my servant Thomas [B. Marsh] I have heard thy prayers and thine alms have come up as a memorial before me in behalf of those thy brethren who were chosen to bear testimony of my name and to send it abroad among all nations kindreds tongues and people and ordained through the instrumentality of my servants. [p.282] Verily I say unto you there have been some few things in thine heart and with thee, with which I the Lord was not well pleased; nevertheless inasmuch as thou hast abased thyself thou shalt be exalted: therefore all thy sins are forgiven thee. Let thy heart be of good cheer before my face and thou shalt bear record of my name not only unto the Gentiles, but also unto the Jews; and thou shalt send forth my word unto the ends of the earth. Contend thou therefore morning by morning and day after day let thy warning voice go forth; and when the night cometh let not the inhabitants of the earth slumber because of thy speech. Let thy habitation be known in Zion and remove not thy house, for I the Lord have a great work for you to do, in publishing my name among the children of men, therefore gird up your loins for the work. Let your feet be shod also for thou art chosen, and thy path lyeth [lieth] among the mountains and among many nations, and by thy word many high ones shall be brought low; and by thy word many low ones shall be exalted, thy voice shall be a rebuke unto the transgressor, and at thy rebuke let the tongue of the slanderer cease its perverseness. Be thou humble and the Lord thy God shall lead thee by the hand and give thee answer to thy prayers. I know thy heart and have heard thy prayers concerning thy brethren. Be not partial towards them in love above many others, but let your love be for them as for yourself, and let your love abound unto all men and unto all who love my name. And pray for your brethren of the twelve. Admonish them sharply for my name’s sake, and let them be admonished for all their sins, and be ye faithful before me unto my name; and after their temptations and much tribulation behold I the Lord will feel after them, and if they harden not their hearts and stiffen not their necks against me they shall be converted and I will heal them. Now I say unto you, and what I say unto you, I say unto all the twelve. Arise and gird up your loins, take up your cross, follow me, and feed my sheep. Exalt not yourselves; rebel not against my servant Joseph [Smith, Jr.] for Verily I say unto you I am with him and my hand shall be over him; and the keys which I have given him, and also to youward shall not be taken from him untill I come. Verily I say unto you my servant Thomas [B. Marsh], thou art the man whom I have chosen to hold the keys of my kingdom (as pertaining to the twelve) abroad among all nations, that thou mayest be my servant to unlock the door of the kingdom in all places where my servant Joseph [Smith, Jr.], and my servant Sidney [Rigdon], and my servant Hyrum [Smith], cannot come, for on them have I laid the burden of all the Churches for a little season: wherefore whithersoever they shall send you, go ye, and I will be with you and in whatsoever place ye shall proclaim my name an effectual door shall be opened unto you that they may receive my word. Whosoever receiveth my word receiveth me, and whosoever receiveth me receiveth those (the first presidency) whom I have sent, whom I have made counsellors for my name’s sake unto you. And again I say unto you, that whosoever ye shall send in my name, by the voice of your brethren the twelve, duly recommended and authorized by you, shall have power to open the door of my kingdom unto any nation whithersoever [p.283] ye shall send them, inasmuch as they shall humble themselves before me and abide in my word and hearken to the voice of my spirit. Verily! verily! I say unto you, darkness covereth the earth and gross darkness the minds of the people and all flesh has become corrupt before my face! Behold vengeance cometh speedily upon the inhabitants of the earth A day of wrath! A day of burning! A day of desolation! of weeping! Of mourning and of lamentation! And as a whirlwind it shall come upon all the face of the earth saith the Lord. And upon my house shall it begin and from my house shall it go forth saith the Lord. First among those among you saith the Lord; who have professed to know my name and have not known me and have blasphemed against me in the midst of my house saith the Lord. For unto you (the twelve) and those (the first presidency) who are appointed with you to be your counsellors and your leaders, is the power of this priesthood given for the last days and for the last time, in the which is the dispensation of the fulness of times, which power you hold in connection with all those who have received a dispensation at any time from the beginning of the creation for verily I say unto you the keys of the dispensation which ye have received have come down from the fathers: and last of all being sent down from heaven unto you. Verily I say unto you, Behold how great is your calling. Cleanse your hearts and your garments, lest the blood of this generation be required at your hands. Be faithful untill I come for I come quickly and my reward is with me to recompense every man according as his work shall be. I am Alpha and Omega:-Amen. [p.284] Thus saith the Lord, my servant Edward [Partridge] and his house shall be numbered with the blessed, and Abraham t[he]ir father, and his name [s]hall be had in sacred rememberance. Awake my shepherds and warn my people! for behold the wolf31 cometh to destroy them, — receive him not. Ans[wer]. Behold thus saith the Lord it is a servant in the hands of Christ who is partly a descendant of Jessee [Jesse] as well as of Ephraim or of the house of Joseph, on whome [whom] thare [there] is laid much power. Ans[wer]. Behold thus saith the Lord; it is a descendant of Jessee [Jesse] as well as of Joseph unto whom rightly belongs the Priesthood and the kees [keys] of the [p.287] Kingdom for an ensign and for the geathering [gathering] of my people in the Last days. A[nswer]. We are to understand that the scattered remnants are exhorted to to return to the Lord from whence they have fal[l]en which if they do the promise of the Lord is that he will speak to them or give them revelation See 6th 7th and 8th verses The bands of her neck are the curses of God upon her or the remnants of Israel in their scattered condition among the Gentiles. for verrily [verily] thus saith the Lord that inasmuch as there are those among you who deny my name, others shall be planted in their stead and receive their bishoprick38 Amen. Revelation given to Brigham Young at Far West April 17th 1838. Verrily [Verily] thus Saith the Lord, Let my Servant Brigham Young go unto the place which he has bought on Mill Creek and there provide for his family until an effectual door is op[e]ned for the sup[p]ort of his family untill I shall command [him] to go hence, and not to leave his family untill they are amply provided for Amen. 1. This text follows the wording in the KRB before later changes were made in the manuscript. The revelation was not published in the 1835 D&C. It was published in the 1844 D&C. 2. See document no. 117; LDS D&C 98; RLDS D&C 95. 3. The date for the redemption of Zion was set as 11 September 1836. Joseph Smith, Jr., wrote from Kirtland, Ohio, in August 1834: “in case the excitement continues to be allayed and peace prevails use every effort to prevail on the churches to gather to those regions and situate themselves to be in readiness to move into Jackson Co[unty]. in two years from the Eleventh of September next which is the appointed time for the redemption of Zion” (Smith to Lyman Wight et al., 16 Aug. 1834, Joseph Smith Letterbook, 1:86, LDS archives). The 11 September date refers to an earlier revelation which stated, “I the Lord willeth to retain a Strong hold in the Land of Kirtland for the space of five years” (see document no. 70 [11 Sept. 1831]; LDS D&C 64:21; RLDS D&C 64:4). See also Dean C. Jessee, ed., The Papers of Joseph Smith: Journal, 1832-1842 (Salt Lake City: Deseret Book Co., 1992), 2:41-42, 58, 91, 188, 203-206. 4. This text follows the wording in the KRB before a few minor changes were made for the 1835 D&C. 5. This revelation was not published in the 1835 D&C. 6. These instructions are a composite of several documents originally written on different dates; brackets are inserted to separate the documents. The April date is based on the journal of William E. McLellin who recorded that Joseph Smith and others of the twelve apostles left Kirtland and went to nearby Huntsburg, Ohio, being there on 26-30 March 1835. There is no record of Smith or the apostles returning to Kirtland. The traditional date of 28 March 1835 is based on a letter dated 28 March 1836 [sic], recorded in the Kirtland Council Minute Book, LDS archives (198). It appears that the March date is in error and that the meeting where the Twelve “had a time of general confession” was held on the afternoon of 28 April 1835 (“A record of the transactions of the Twelve apostles,” 1835, in Patriarchal Blessing Book 1, LDS archives). 8. The first Seventies in the church were ordained on 28 February 1835. 9. Brackets in 1835 D&C. 10. Evangelical ministers are understood to be patriarchs. 11. Included here is a list of ordinations from Adam to Noah said to be written in the book of Enoch. 12. Brackets in 1835 D&C. 13. The age of Enoch when he was translated appears to have been added while changing the ages of the patriarchs in reviewing the Genesis revision text in 1835. The words added above the line are: “& al[l] the days of Enoch were 430 years” (OT MS #1, 19, RLDS archives). See Gen. 7:78 (JST); Moses 8:1 (PGP). 14. See document no. 78 given at Hiram, Ohio,  November 1831. 15. Mary Bailey Smith, wife of Samuel H. Smith. 16. The journal then states: “he come [came] in about one hour after that and in the course of about 2 hours she was delivered and thus what God had manifested to me was fulfilled every whit.” The child born was Susanna Bailey Smith. See Jessee, Papers of Joseph Smith, 2:55. 17. The journal entry continues: “I went im[m]ediately and del[i]vered this message according as the Lord commanded me I called him in & read what the Lord had said concern ing him, he acknowledged that it was verily so & expressed much humility.” See Jessee, Papers of Joseph Smith, 2:62. 18. See document no. 41; LDS and RLDS D&C 38. 19. This text follows what was recorded in 1835. An added explanation by William W. Phelps is not included. After the word “errors” Phelps added, “for which they made satisfaction the same day” (Joseph Smith 1835-36 Journal, 22, LDS archives). See Jessee, Papers of Joseph Smith, 2:68. 20. The church purchased some Egyptian papyri together with four Egyptian mummies from Michael H. Chandler in July 1835. Warren Parrish was called as a scribe to Smith for work on the Book of Abraham. In 1838 Parrish wrote, “I have set [sat] by his [Smith’s] side and penned down the translation of the Egyptian Hierogyphicks [Hieroglyphics] as he claimed to receive it by direct in spiration from Heaven” (Parrish to Editor, 5 Feb. 1838 in Painesville Republican 2 (15 [i.e., 22] Feb. 1838). See Jay M. Todd, The Saga of the Book of Abraham (Salt Lake City: Deseret Book Co., 1969), 185. 21. Parrish became a scribe to Smith on 29 October 1835. He kept Smith’s journal at various times during 1835-36. Parrish wrote in February 1838, “I have been Smith’s private secretary, called to fill this high and responsible station by revelation which I wrote myself as it dropped from the lips of the prophet” (Parrish to Editor, 5 Feb. 1838, in Painesville Republican 2 (15 [i.e., 22] Feb. 1838). 22. The text in the journal says that Smith also saw Michael in this vision. Prior to this time, it was taught that Michael was another name for Adam. 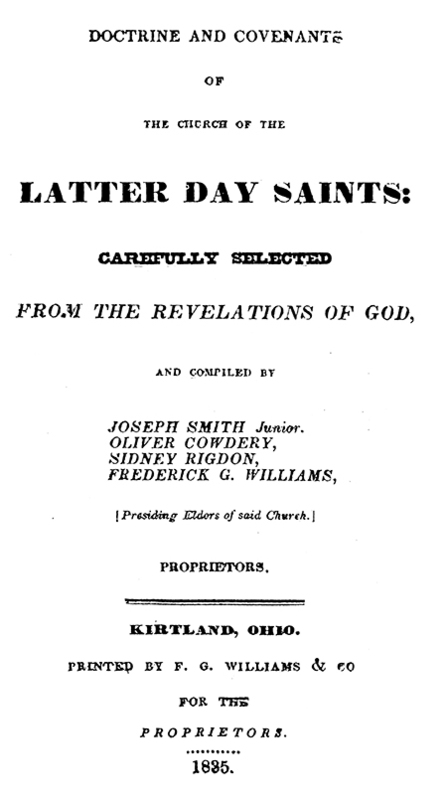 Oliver Cowdery wrote in a letter in January 1834, “I have been in formed from a proper source that the Angel Michael is no less than our father Adam” (Cowdery to John Whitmer, 1 Jan. 1834, Oliver Cowdery Letterbook, 15, Henry E. Huntington Library, San Marino, California). 23. Alvin Smith died on 19 November 1823 at age twenty-five. 24. Brigham Young became the second president of the LDS church. In December 1847 the First Presidency was organized with Young as president. 26. This account was copied into Smith’s journal by Warren A. Cowdery who arrived in Kirtland on 25 February 1836. He edited Smith’s first-person journal to a third-person history for the dates of 22 September to 18 November 1835. The entries of 2 and 3 April 1836 are written in third-person. It appears that Cowdery used a first-person account but recorded the entries in the third-person as he did for the 1835-36 History. 27. Stephen Post recorded the events in the Kirtland temple: “P.M. partook of the sacrament confirmed a large number & blessed those little children that had not been blessed. the curtains were unfolded & confirmation, sacrament &c was attended to in 4 parts at the sa[me] time, the presidency took the pulpit during the confirmation & blessing of the children after which the curtains were raised & the people dismissed” (Stephen Post Journal, 3 Apr. 1836, LDS archives). 28. The mention of “Elias” appearing to Joseph Smith and Oliver Cowdery is curious since in a subsequent vision “Elijah” stood in their view. Elias is used for Elijah in the Greek NT. Whether this is a scribal error made in the journal entry is not known. 30. The text of this revelation in the SB contains some alterations made at a later date. This transcription follows what was originally written in 1838 when it was copied into the SB. 31. David W. Patten stated on 5 February 1838 that the wolf “was the dissenters in Kirtland” (Donald Q. Cannon and Lyndon W. Cook, eds., Far West Record: Minutes of the Church of Jesus Christ of Latter-day Saints, 1830-1844 [Salt Lake City: Deseret Book Co., 1983], 138). 32. See document no. 126; LDS D&C 107; RLDS D&C 104. 35. Af ter financial trouble and internal dissent in Kirtland, the First Presidency moved to Far West, Missouri. 37. Elias Higbee was a member of the High Council of Zion at Far West, Missouri. See Cannon and Cook, Far West Record, 145-57. 38. Bishoprick (Bishopric) in this case means apostleship.